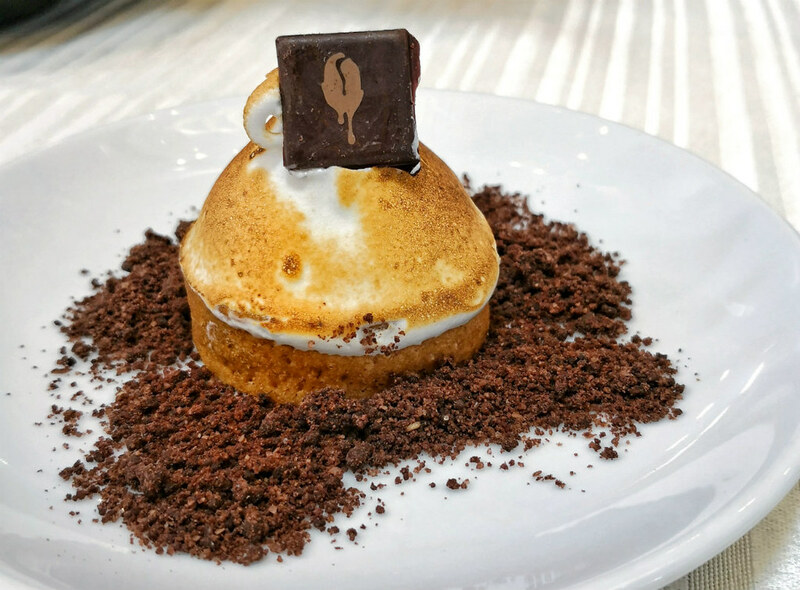 Robertson Quay never fails to fascinates the foodies and folks who wants to chillax. Housed on the second level of the InterContinental Singapore, the casual Japanese Gastrobar Plum & Toro serves mod Jap cuisines with an impressive collection of wines and creative cocktails. 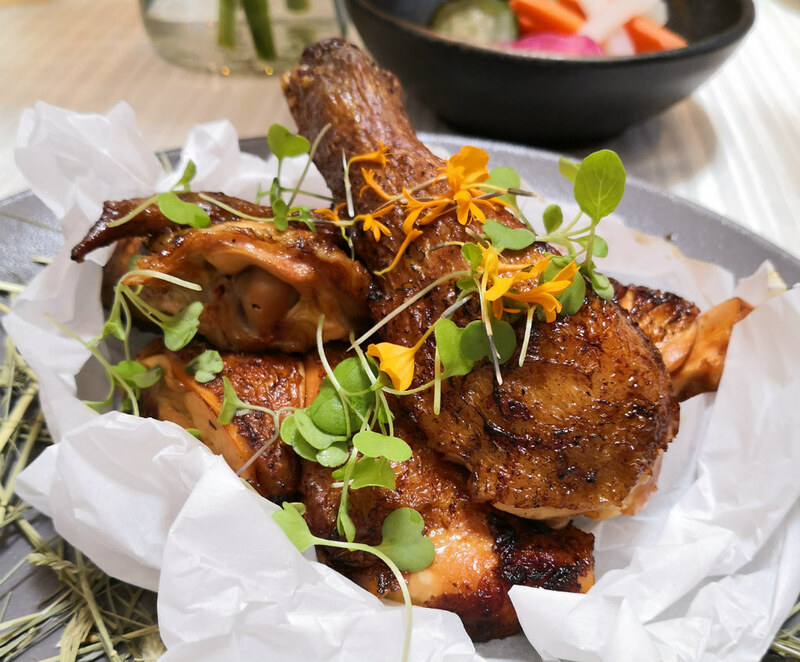 The sleek and casual ambience with its lip-smacking, Instagram-worthy teppan and chargrilled dishes should be a huge draw for working professionals or couples who want some intimate conversations. Starting off with something luxurious, we had the Fresh Oyster ($8). 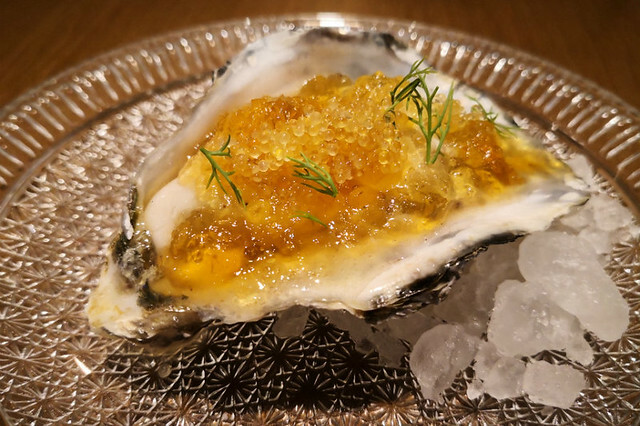 Huge hygo oyster with a spoonful of dashi jelly and golden tobki. All eyes were on to the oyster and the slurp was invigorating – subtle, citrusy, bursting of ocean freshness. Understand that oyster taste will be stronger when cooked but nothing beats the pureness of a freshly shucked oyster. It was a feast to the eyes when we took our glance onto the Sakura Ebi Somen ($20). 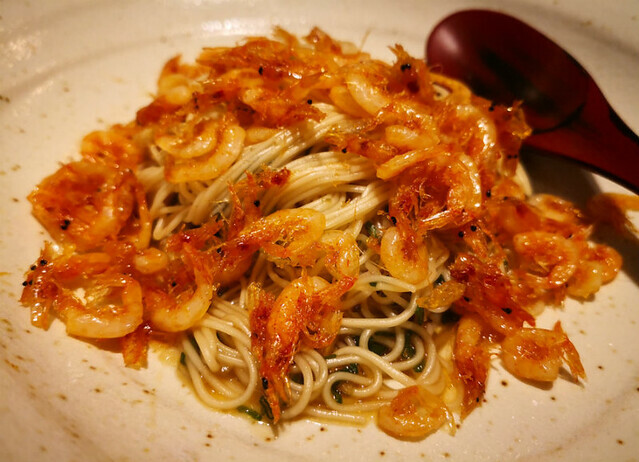 The stir-fried cherry blossom shrimp adds vibrancy and depth in flavour to the otherwise simple plate of noodles. Tossed with thin noodles and scampi oil, the noodles by itself was quite delicious. This dish was surprising light, flavourful with a slight crunch from the shrimp. 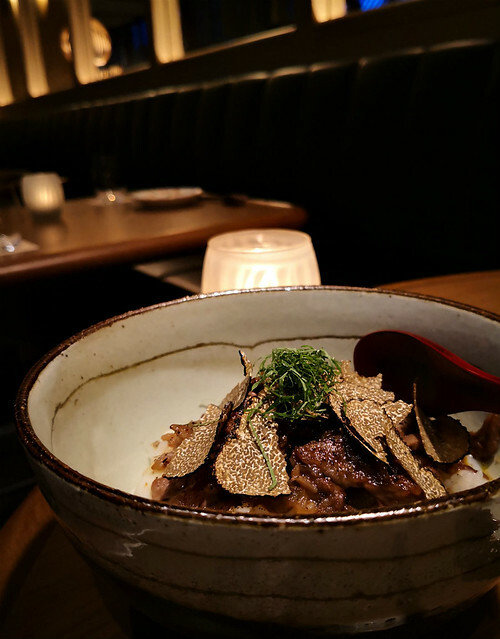 Now for the ultimate, premium indulgent, we had the Wagyu Truffle Don ($40). Wagyu beef kiriotoshi, served with onsen egg on pearly white Japanese rice, was meaty yet delicate, and flavourful. Topped with generous slices of fresh truffle, elevating the umami of this dish. The whole space had the pleasant truffle smell when we tucked in to it. High recommend for those who wants to impress their other half with something decadent. Reminding my fond memories of my last trip to Osaka, where I had a warm Japanese sweet potato on hand in a cold November winter. 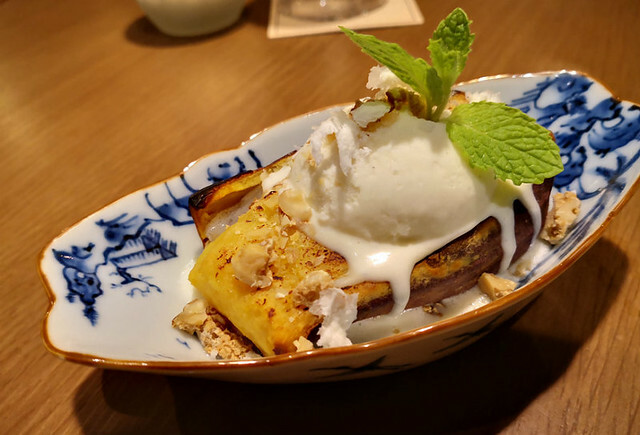 The Satsuma Imo ($15) just topped the normal Japanese staple a notch with an ultra-smooth vanilla ice cream topped with sprinkle of snow salt to open up your palate. Who knows sweet potato and ice cream makes a pretty awesome pairing. On top of the restaurant seats, Plum & Toro also has a 10-seater cocktail bar with liquor and sakes imported from Japan. For something original and fruity, order their signature cocktail P&T ($22). 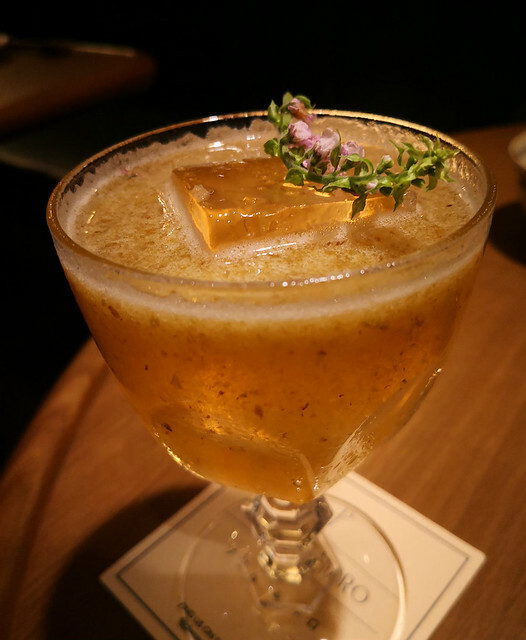 Using Umeshu and Shiso liquor which delivers a polished taste yet sleeky at the same time. Overall, the food here are visually pleasant and well-balanced in flavour, modern yet has the hint of Japan. You can expect me to drop here anytime for a drink or some teppan. 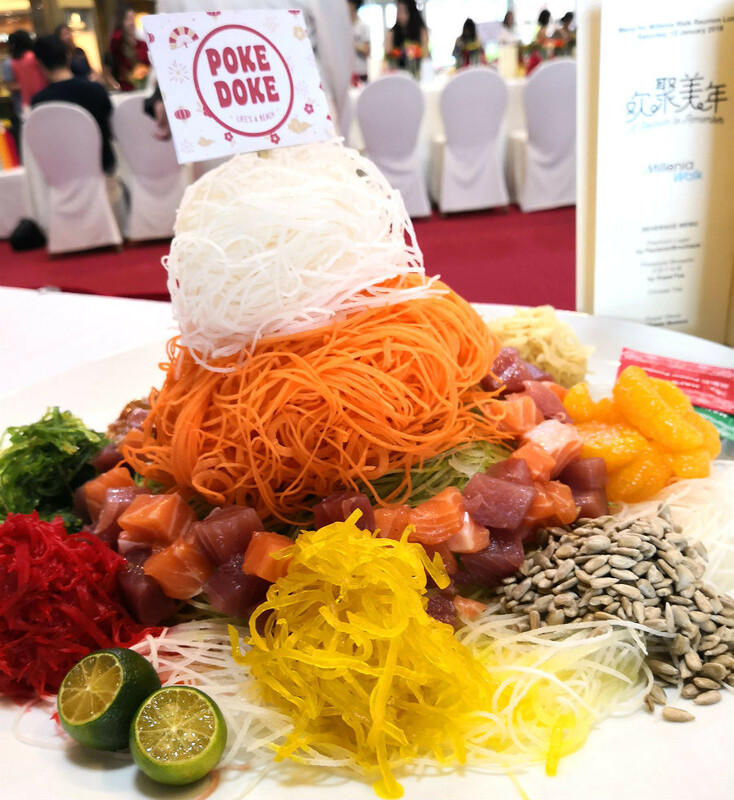 SUN with MOON Japanese Dining & Café has recently unveiled its latest 2018 grand menu. Situated in Wheelock Place, the new menu is specially curated by Executive Chef Mr Toshio Sawai, who had an illustrious culinary career beginning all the way back in Kitcho, one of the most luxurious and reputable Japanese restaurants in Japan, in 1983. The latest menu features a repertoire of brand-new creations, together with new spins on all-time favourites. Don’t expect only the traditional Japanese food; there are some innovations which to me are quite interesting. 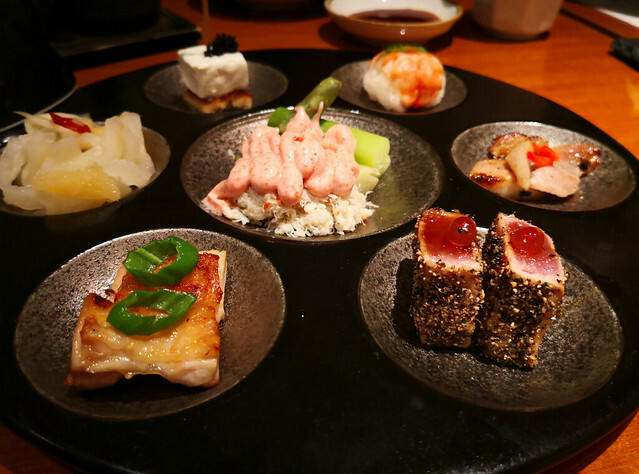 The Chef’s tenacity to break off from the traditional can be felt with the Zensai Mori Appetiser ($16.80). Showcasing an indulgent platter of 7 chef-curated appetizers which includes light dishes such as mini prawn sushi, crabmeat and asparagus with mentai sauce, pickled radish with yuzu and herring roe, as well as savoury ones like grilled unagi with cream cheese, seared mini tuna steak with black pepper, grilled pork belly or grilled chicken thigh. 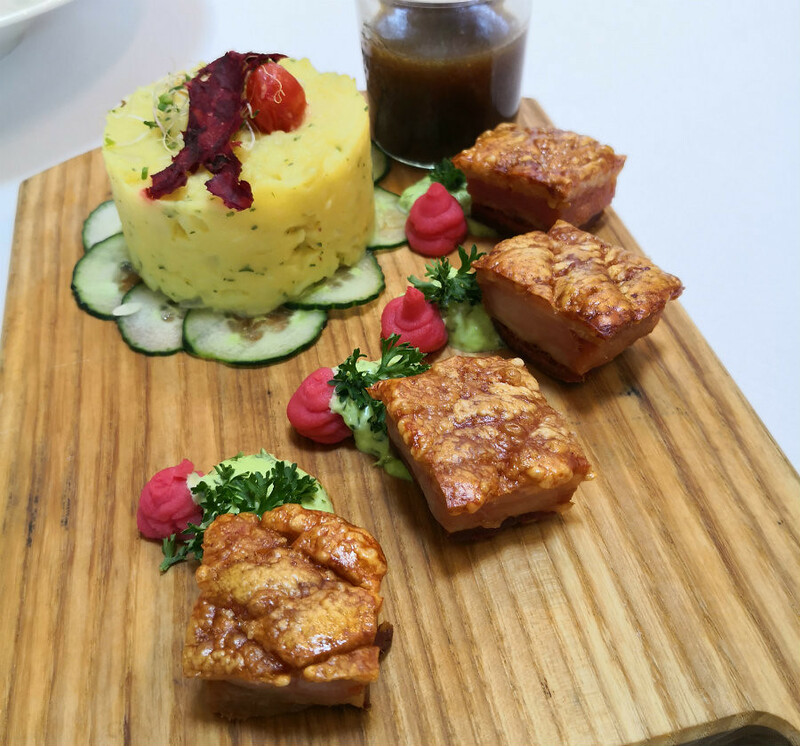 This dish is meant to whet your appetite and transition you to subsequent dishes. What comes next after a refreshing, quasi-Japanese appetizer is the Niku Atsu Hotate & Unagi Kamameshi ($26.80). 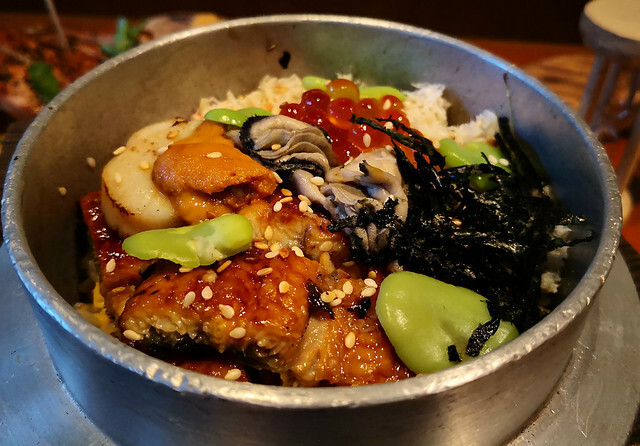 More of an authentic Japanese dish you might expect in an izakaya, the steamy iron pot is topped with luscious grilled unagi, thick-cut flamed-seared scallops with fragrant Japanese rice. The accompanying soup broth and kamameshi ingredients are all meticulously prepared for a satisfying Japanese traditional dish. Being a seafood lover, I find the unagi and scallops irresistible and rich in umami goodness. Can you spell LOVE? The Beef Miso Dare Sukiyaki ($25.80) is definitely the highlight and makes my day. The piping hot stew is made with Executive Chef Sawai’s original miso dare blend with hatcho (soybean) miso from Okazaki in Aichi Prefecture. I loved the cleverness of using diced US Ribeye beef cubes instead of the standard sliced beef in order for the meat to retain its rich meaty flavour longer. It’s my sure favourite and I would definitely order this if I am back for good. The Steak Moriawase ($45.80) do brings out the insatiable carnivore in me. 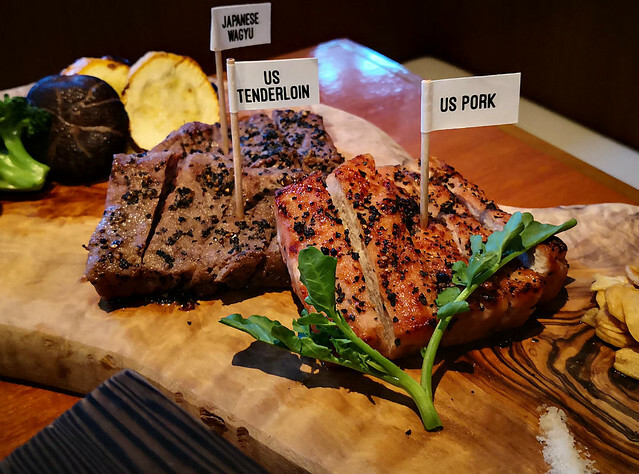 Featuring a succulent grilled steak combo of Japanese Wagyu, US Tenderloin and pork steak (300g), diners can pick 4 sauces, of which 3 are the restaurant’s original sauce blends – black pepper, red wine and goma mustard sauce. Both the Wagyu and Tenderloin tastes succulent with a satisfying firm texture, while the pork is slightly dry. 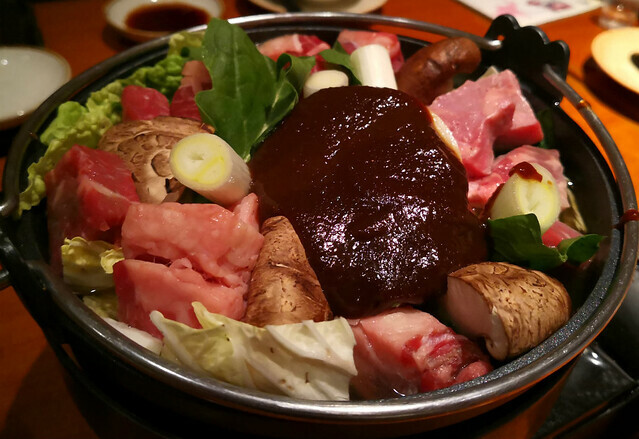 Nevertheless, this dish is quite unusual in a Japan restaurant setting in terms of its meat selection and visual presentation. Let’s call it a playful seafood indulgence; the Temari Sushi ($23.80) are bite-sized mini sushi balls which kids would surely take them to be yummy pokeballs up for grabs. 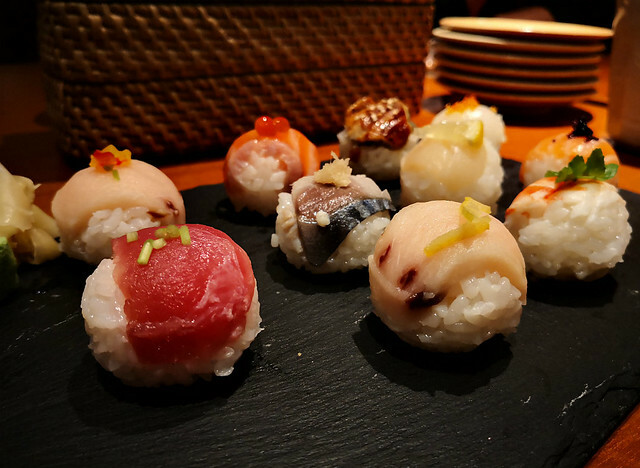 The molded balls of Japanese sushi rice are topped with fresh tuna, salmon, scallop, grilled eel, yellowtail, mackerel, swordfish, cuttlefish, salmon belly and boiled prawn. All nice things end with sweetness in the mouth. 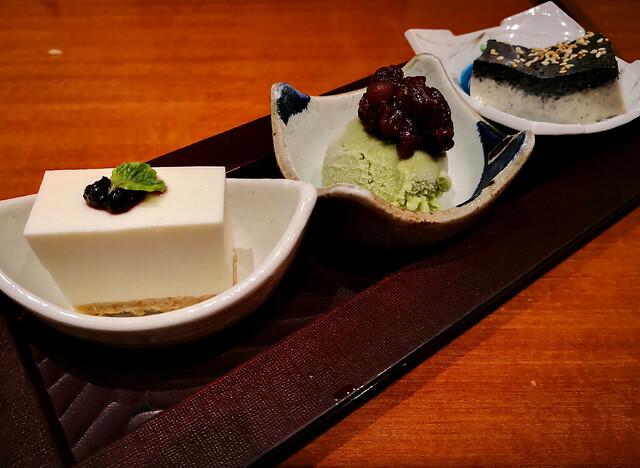 The perfect ending goes to the Dessert Trio ($9.80), consisting of a cool ensemble of Goma Pudding, SUN’s Tofu Cheesecake and Matcha Ice Cream. Light, delicate and smooth, the sweetness explosion (especially the Tofu Cheesecake!) floats me right up into the ether. 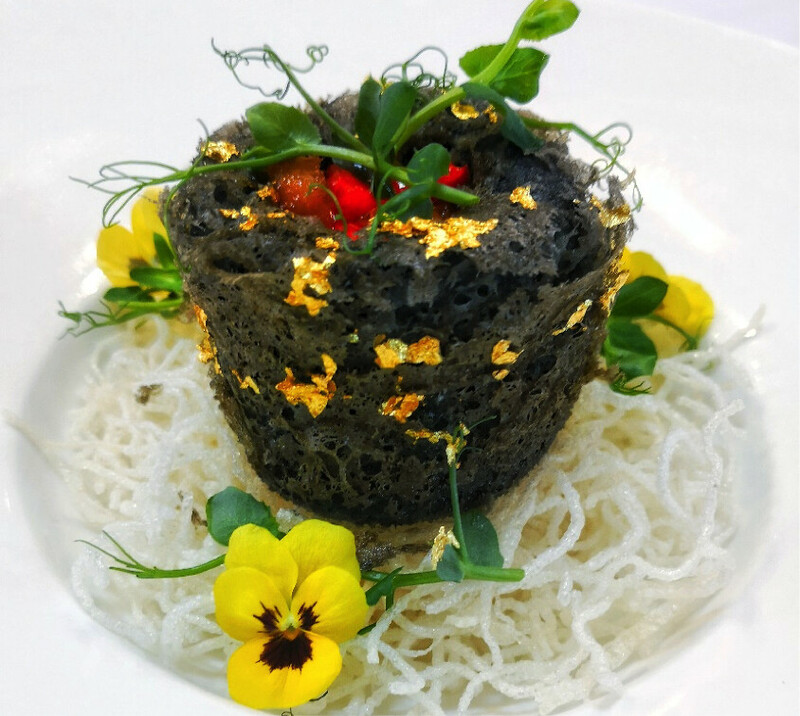 Overall, SUN with MOON Japanese Dining and Café presents a contemporary cuisine that moves beyond traditions. While the flow of food served feels like a 6-course dinner in a fine-dining setup, they are sold ala carte and good for 4 pax.